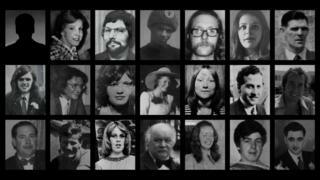 A "pristine" semi-automatic pistol was found by a police officer dumped under a bench near one of the Birmingham pubs involved in the 1974 bomb blasts, an inquest jury heard. The handgun was found after the first of two bombs had gone off at the Mulberry Bush in the city centre. Retired West Midlands Police constable Adrian Howles said he had handed the gun to an inspector at the scene. He said he did not know what had happened to it since. The inspector denied being handed the weapon. The blasts at the pub in the city's Rotunda, and in the basement of the Tavern in the Town on New Street, killed 21 people and injured 220. Giving evidence at the inquests earlier, Mr Howles said that when he arrived at the Mulberry Bush, two youths "just on the other side of Worcester Street" attracted his attention, before telling him that there was "something suspicious" beneath a bench. It was then that he discovered the weapon, he said. "I would have thought if something had been left lying underneath there... it would have gathered dirt, but it didn't, it looked pristine", he added. He gave it to Insp Roderick Richards as soon as he could, he said. However, in a statement, Insp Richards said that PC Howles had not handed him a firearm. Mr Howles said it had later occurred to him that the weapon could have been dropped by a perpetrator. He said he never found out what had happened to it. Previously, the inquest heard that police did not collect CCTV from that night.